Just a 750 m from the holy Haram, Dar Al Eiman Grand is set in the lively Ibrahim Al Khalil Street in Mecca. It features elegantly decorated rooms and a restaurant that offers a 24-hour rooms service.Fitted with blue carpeted and tiled floors, all rooms at Dar Al Eiman grand are decorated with rich fabrics and ornate furnishings. They are all equipped with satellite TV channels, air conditioning and a wardrobe.A number of restaurants and shops are located within a walking distance from Dar Al Eiman. King Abdul Aziz Airport is 60 minutes by car. We speak your language! 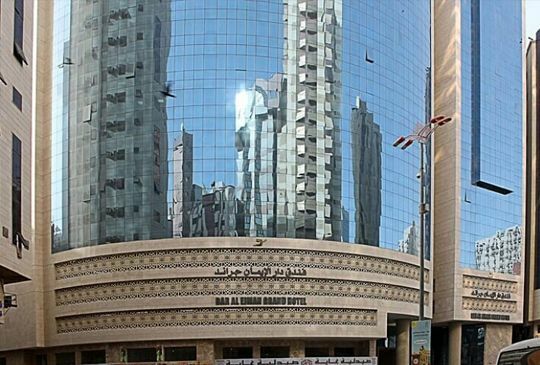 This informal hotel catering to Muslim guests only is a 13-minute walk from the 7th-century Prophet’s Mosque, 7 km from the 7th-century Quba Mosque and 22 km from Prince Mohammed Bin Abdulaziz International Airport. Featuring city or mosque views, the unassuming rooms with simple furnishings have flat-screen TVs and minifridges, as well as tea and coffeemaking facilities. Wi-Fi is offered for a surcharge.An airport shuttle can be arranged.